She just sticks us up here for, for. . .color! It's true. We look good above the flower photo down there. That's like buying a painting to match your sofa or a dog to go with your coat. She treats us like objects--and I don't mean the celebrity blogstar objects that we are. Did you know people actually email her requesting more photos of us? Did you know that? I have to get to work on my blog. I need to steal more pictures of us. She has an entire folder named Chickens. And a separate one called Whitey. We are totally underappreciated. We simply don't get enough respect around here. Or attention. Or treats. I didn't see her flipping any of those multigrain pancakes over to us during that breakfast revolt. Or crepes. Or peanut butter waffle sandwiches. No, it's kitchen scraps, moldy cheese, and banana peels for old Lindy and Whitey. It really is a miracle we're still alive. And we even went back to laying eggs. I think it's our fans that keep us going. We have to think of them. What would they do without us? OK, you've well and truly lost it! A touch of Spring fever? And so, what is the boring little announcement? Can you cover the chickens' ears for a sec while I ask you a question? What breed are your sheep--Suffolk, maybe? I ask out of curiosity, and because the prevailing opinion has shifted from goaty to sheepy around here. We're strongly considering Barbados Blackbellies because they can stand the heat and have (they say) 90 percent fewer parasites than woolly breeds are plagued with in the SE. Our climate isn't really very suitable for handsome woolies like yours. Well, now, don't you ladies look nice? Hope to see you soon, on a t-shirt. Animals do discuss us behind our backs you know. Those hens are just beautiful girls. Thanks for the new pics! I see the snowflakes on your masthead have faded now that spring is here. Your artwork would make a cute quilted wall hanging! you're killin' me with the suspense! what's the "boring little announcement"? Oh, and tell Lindy and Whitey that they may soon have other bloggin' chicken buddies-- just found out I can get some hens! Hey Lacy- you won't be sorry! That chicken on yr blog today is some kind of walking feather boa, though. She looks like she might be a little out of control.Did you plug her into an electric outlet, or what? Gotta check with the Dallas chicken posse on that one! So can the chickenz do any tricks? Roll over? Fetch? Anything? If not, maybe you can get a picture of them riding on Dan's back or something. You know, to make it "cute". Just remember , Jeff-o-there are chickens in Arizona too. Where ever you go, whatever you do...there might be some poultry watching you. Those chickens are beauties and you have quite an imagination! Thank you Tim, we're very flattered. FG does have a wonderful imagination, of course, but we are Chickenz! Our Alpacas talk & laugh all the time they think I am the entertainment...Our chickens follow me like a pack of puppies begging....just like yours..
Wow, this is great! 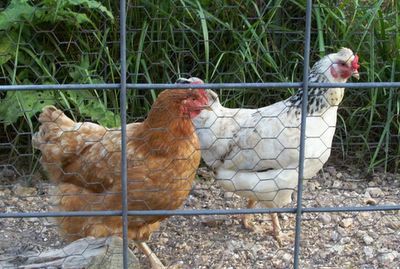 We are "hen-vious"... You get many more words on this blog than our human lets us have on her blog. But we get photographed fairly often... check us out under the entry "Distraction"... looking good, yo.